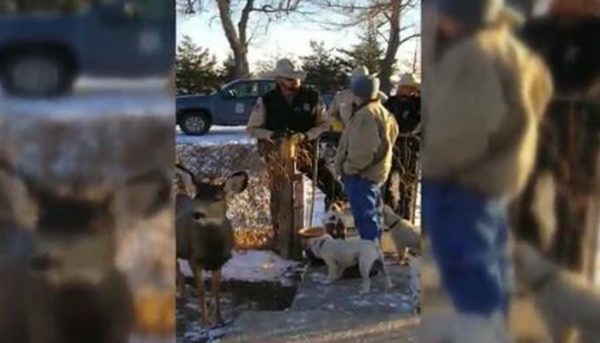 A family in Kansas say they were traumatized when a state game warden shot and killed their pet deer in their front yard. Taryn McGaughey told NBC Channel 14 News in Kansas how the warden had cited her mother for possessing a wild deer, but instead of allowing time for due process or for them to try and relocate the deer, the warden came straight to the house and terminated the animal’s life. Cell phone video of the encounter was shared with local media showing the warden explaining the situation. “If I go get a search warrant to seize this animal, when I come back, I can’t guarantee it’s gonna be here. So right now I have what’s called exigent circumstances to come into your property and seize this evidence,” the warden said. McGaughey said they took the deer in after its mother was killed as a way to care for the animal and it ended up taking well with their pets and family. In December the deer became the subject of an investigation by state game warden officials, which apparently had the authority to dispatch the animal. “To see their pet shot, it was traumatizing. It’s terrible,” said Taryn McGaughey. She says the deer her mom had cared for during the past two years was like part of the family. “It’s like losing a pet. My son, my mom, even my dad, we’re pretty sad,” she said. McGaughey said she wants justice for her family and doesn’t understand why they weren’t given an opportunity to relocate the animal.